Who says that there can't be occasional agreements across the partisan divide? The free-market, liberty-loving editorial board at Investor's Business Daily and a Bernie Sanders-supporting columnist at the Huffingon Post agree on one thing: Hillary Clinton should withdraw from the presidential race. Okay, IBD wants her to "suspend," while HuffPo's H.A. Goodman says she should "concede." Both missives declare that Mrs. Clinton's withdrawal should be based on the FBI's criminal investigation into her "homebrew" server and her alleged reckless treatment of classified emails and the information contained therein. Here's the dirty little secret the establishment press won't acknowledge: Mrs. Clinton's criminal and other problems simply must have impacted her horrible losses in five of the six most recent nomination contests. 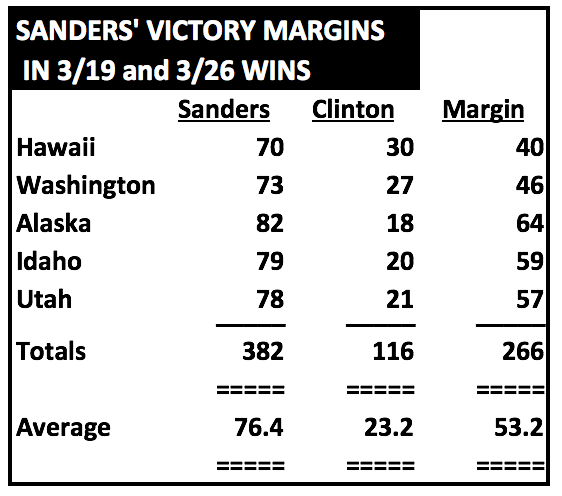 Sanders routed Clinton by an average margin of 53 points in Idaho (79-20), Utah (78-21), Alaska (82-18), Washington State (73-27), and Hawaii (70-30). As I noted in reference to the latter three contests on Saturday, these are precedent-shattering victory margins for a trailing candidate. The establishment press, which is mostly still in Hillary-protecting mode, has almost completely kept the size of Sanders' victory margins out of their dispatches on the results. No reasonable person can possibly believe that the margins of Sanders' victories are not at least partially due to the fact that Democratic Party voters have figured out that Hillary Clinton's criminal investigation-overhanging appearance on the general-election ballot flirts with disaster. Corruption: Though she tries to ignore it, Hillary Clinton can’t escape her email problem. Almost every day brings more trouble for her. It’s time she did what a decent person would do — temporarily shelve her presidential campaign. While Clinton leads Sen. Bernie Sanders in the delegate count, the former secretary of state is far behind everyone on the ethical score. She is consistently battered by news that reminds voters just how corrupt she is and now is facing a report that the FBI director is convinced she broke the law. ... If the Clinton camp thinks her email scandal will die down, it’s mistaken. The news will keep coming and none of it will be good for Clinton. Even if the Justice Department declines to charge her, the backlash would be harsh. If that happens, expect two things: Watchdog groups will sue for investigative documents to be made public while the most damning of those documents will be leaked to media outlets that will actually publish them. ... Clinton should do what’s right and suspend her campaign until this issue is resolved. It’s unseemly for one of the party’s top candidates to be under such a growing cloud of suspicion. Note that IBD didn't even get around to calling for the release of the transcripts of Mrs. Clinton's $200K-plus speeches to Wall Street firms and others. The Sanders campaign and the New York Times, among many others, have done so. One would think that Team Sanders would make the release of the transcripts a pre-condition for the "change your tone" debate Team Clinton insists on having if they face off in a New York debate before that state's April 19 primary. The column by HuffPo's Goodman is extraordinarily long. The writer clearly felt the need to go step-by-step with his readers to emphasize the degree of jeopardy Mrs. Clinton faces. The fact is that he probably had to, since readers relying on the establishment press have been largely shielded from the news about Mrs. Clinton's travails. One example: Just last Tuesday, the Associated Press still insisted that "EXPERTS SEE LITTLE CHANCE OF CHARGES IN CLINTON EMAIL CASE." More of the same "nothing to see here, move along" nonsense. ... federal prosecutors will interview Hillary Clinton, in addition to her close associates. At what point will establishment Democrats admit this fiasco is horrible for a general election? When federal prosecutors are interviewing your candidate for president, even Donald Trump has a good chance at the White House. Furthermore, former U.S. attorney general Michael Mukasey believes A Criminal Charge is Justified. Former Obama intelligence official Lt. Gen. Michael Flynn says that “If it were me, I would have been out the door and probably in jail.” Former NSA director Michael Hayden called Clinton’s email setup “stupid and dangerous.” Even Edward Snowden, the antithesis of America’s intelligence community in many ways, says it’s “ridiculous” to think Clinton’s emails were secure. It’s time for Democrats to deal with reality, not just allegiance to a political icon, and rally around the only candidate not linked to an FBI investigation, and other controversies. With recent victories and future wins ahead, Bernie Sanders has all the political momentum heading towards Election Day. Most importantly, Bernie Sanders is the only leading candidate with positive favorability ratings in 2016. ... However, “political idiocy” is indeed criminal, when there’s intent and motive involved in the idiotic behavior. ... Remember, Trump can’t ask Bernie Sanders for his Goldman Sachs speech transcripts during a televised debate. Clinton’s campaign can’t even stand being pointed at, so just imagine Trump explaining why he donated to Clinton’s Senate campaigns during a debate. Bernie is by far the superior candidate, and already matches up better against GOP rivals; without the myriad of issues faced by Clinton. For the country, and especially the Democratic Party, Hillary Clinton should concede the nomination to Bernie Sanders. Both writers may be wrong, in the following sense: If Sanders is actually able to defeat her — a result which still has to be seen as a less than 50-50 prospect, we may finally see that there's a river even Democratic Party voters won't cross in supporting their candidate. If so, that would seem to bode better for the future of the republic than what we've seen during the past seven-plus years from our current president and his then- and now former-Secretary of State. More broadly, this may be yet another instance in which the press's instincts to protect their favorites end up harming their leftist causes. If the press had conscientiously covered the developments in the Clinton email scandal — and Benghazi, and the Clinton Foundation, etc. — Mrs. Clinton's candidacy might never have gained traction, and other candidates besides Sanders might have entered the race instead of being scared away by Ms. (Supposedly) Inevitable. Now, it's either a damaged Hillary or far-far-left Bernie. Though they'll never admit it, the press cannot possibly be pleased with how this has been working out — and they only have themselves to blame.